The new update 0.18 released 7/14/2011 has missing destinations on the flightpaths when choosing a destination. I had to uninstall 0.18 and reinstall the 0.17 and everything is still working fine for the moment for current patch 4.2, so I advise use the 0.17 version of Questhelper 2 for patch 4.2 to avoid any issues until any further issues arise from the next patch or until the issue found in 0.18 has been fixed. Until then, ignore the Questhelper 2 update if it is 0.18!! 0.18 is broken!!! Well it auto updates itself, so as soon as you do couple of quests there it starts working fine again. at least for me it did. I'm not going to sit here and argue. QH2 is better than the original QH by a lot. I'm not faulting Smariot for doing other things. I just hate seeing promising mods which improve things fall by the wayside. gOOvER and I are working on taking the project over anyway. The original QH is not cutting the mustard right now as not all of the 4.0.3a cata content is recorded yet. QH2 has that for the most part which is nice. For the ones who are QQing cuz smariot decided to do something else with his free time, I have three words for you......get over it. @smariot- You have done a wonderful job on this project and look forward to more updates whether it be now or later. If you choose to never look at this thing again then THANK YOU for donating your time on a project for other players to enjoy...even if it was for a short time. I uploaded 0.18. I didn't get around to adding the linkages for the new maps Blizzard added (mostly Outland instances and raids), and the Horde portals to Hyjal, Twilight Highlands, and friends are missing or incorrect as I don't have an 85 Horde character to look around with, but it should hopefully work better with 4.2 than 0.17 did. Been trying to submit data too you for a while but it's not working right now. I know how much internet can be a bit of a pain. I'll keep trying in the mean time. I found the data for Firelands and whatnot; it was in Data/Cache. I thought that directory was for hotfixes, but clearly I was wrong. I'll try to fix up the zone linkages tonight so you can have a version of QH2 that works more or less correctly with 4.2. If you have data to submit, now would probably be a good time to do so. My internet connection is being a pain right now, so if you can't connect, try waiting half an hour. If you can do that for us Smariot it would be great. If not gOOvER and I will figure something out. Or at least update QH2 one more time with somewhat current code would also help. Anything is helpful. I was going to try to at least update the static database for you, but I can't find the Firelands. Then again, Throne of the Four Winds seems to have vanished too, so my scripts probably aren't reading the patch data for 4.2 correctly. It's not a question of programming but time constraints. I would happily help manage the project with anyone and test it if a few people could help with the programming while the people helping manage the project make sure it's development continues and not wasted. Keep me updated. I'm willing to help. You have wasted everyone's time with this great mod. I understand things happen and people lose interest but you came in before Cata was released to save QuestHelper because the original author suddenly decided to abandon it altogether and you conjured up QuestHelper2. If I had the time I could take this project over but at present I work 12 hours 4 days straight with 4 days off and have a family. If I could work out the time to work on this project I would need a sub-author to do most of the work, but I'm not like that. I'm irritated that another great promising mod gets abandoned. If I was in your shoes I would have had a helper getting the grunt work done while you just managed the project and certified each new release but again, you just abandoned the project and made promises you couldn't keep. Anyone else feel the same way as I do here? Why did you abandon it? What's the reason? You ever wonder what wonderful things the world will never see because of the trillions of man hours that World of Warcraft refined into valor points? This thing badly needs updated. It has no database for the Firelands dailies. It's been past May. I just wonder what's the hold up. Only reason I like this over QuestHelper (and choose to use this over it) is because it shows all quests. 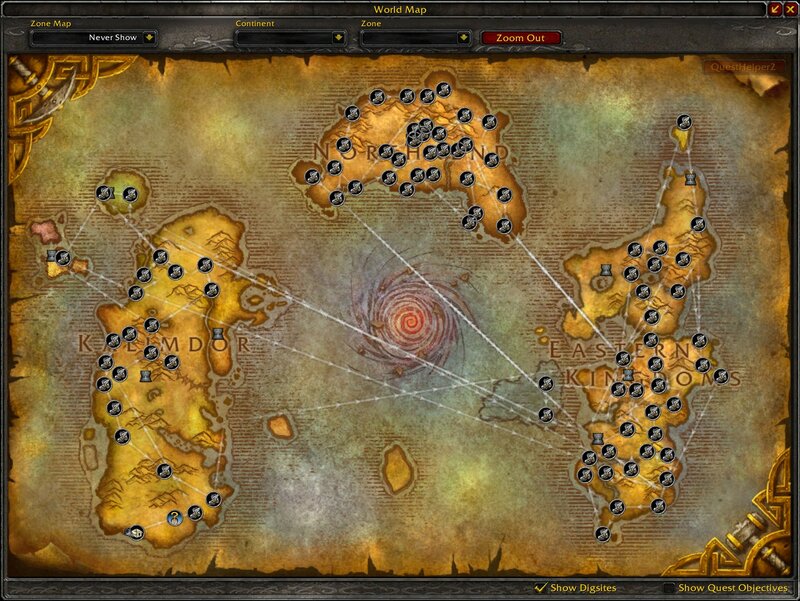 It has a database for Cata zones, and mostly knows where the quests are. It is released... well as beta I use it all the time. but I take it you mean to release an actual release version so everyone can see it on curse and download it?